Hi, how was your weekend? I woke up bright and early on Sunday after crashing early the night before. 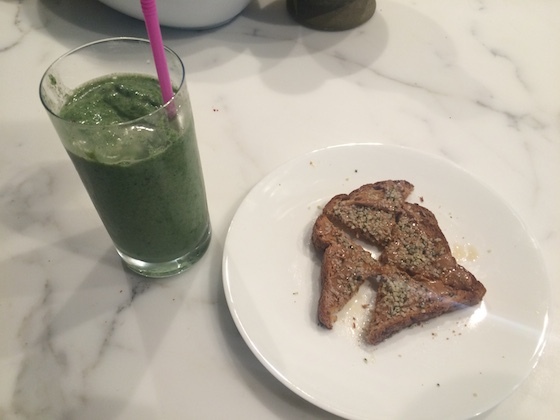 My day started with a great workout in the neighborhood, and then I came home to this breakfast: a smoothie and toast! In the smoothie I included frozen banana, grapes, and spinach, plus a spoonful of peanut butter and about a cup of almond milk. It was very green and very yummy! I topped my toast with some more peanut butter plus a drizzle of honey and a sprinkle of hemp hearts. I spent the next few hours hanging out at home. I did some writing and reading, then prepared this lunch. It was a delicious little snack plate. 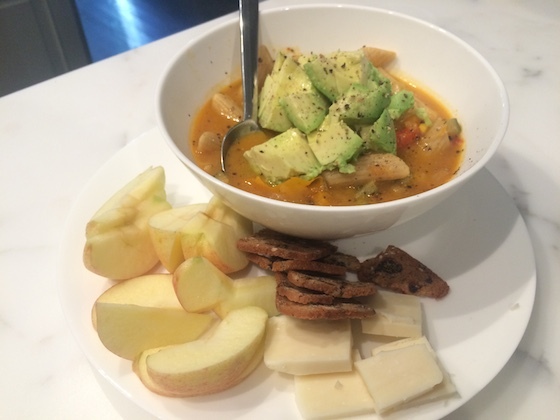 Some leftover soup topped with avocado, plus a sliced apple, some white cheddar, and a few crackers. Apples with cheddar is one of my favorite fall snacks! Then, I headed to Berkeley to spend the evening with my mom. 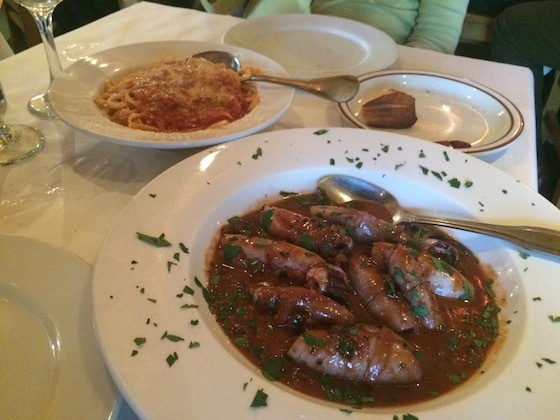 We went out for dinner at a favorite local Italian restaurant. We shared a delicious caprese salad to start, then followed with this dish of calamari in red wine sauce and pasta with tomato sauce – it was unusual but very good. We drank rose and had so much fun chatting and catching up. After dinner we treated ourselves to a scoop of gelato, stopped in at a bookstore, and then headed to bed early.